A million families are dependent on food banks. The most commonly used figures for food bank use come from the Trussell Trust. They show a million uses (not individual users) of food banks in 2013/14. The Trust isn't the only organisation running food banks, so we don't have a figure for the total number of people using food banks. 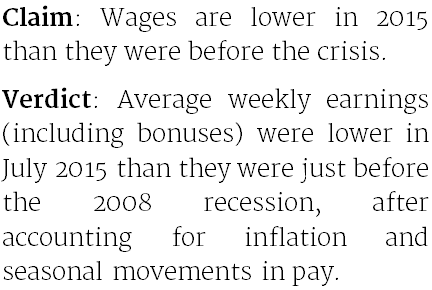 Wages are lower in 2015 than they were before the crisis. Average weekly earnings (including bonuses) were lower in July 2015 than they were just before the 2008 recession, after accounting for inflation and seasonal movements in pay. 800,000 of the "2 million jobs created" are zero hour contracts. We have no way of knowing how much of the increase in employment (the "2 million jobs") over last Parliament came from zero hour contracts. John McDonnell argued on last night's BBC Question Time that some of the government's economic boasts are hollow. He said that there'd been a rise in zero hours contracts, falling real wages and a million families dependent on food banks. We've taken a look at his claims. "The two million jobs that have just been mentioned, 800,000 of them are on zero hours contracts." We have no way of knowing how much of the increase in employment over the last Parliament—which the two million jobs refers to—came from people on zero hour contracts. The 800,000 figure might be a reference to the latest estimate for the number of people with zero hour contracts as their main job, which is a bit lower at 744,000. This was just the number of people on zero hour contracts at one point in time, not an estimate of the increase in the number of people on these contracts. We can't accurately say how the number of people on zero hours contracts has changed over time. The estimates of the number of people on these contracts come from a survey, and have been affected by growing awareness of zero hours contracts. As zero hour contracts have gained public attention, people might simply be more likely to be aware that they're on them and so more likely to report being on them. The only zero hours contract figures we can compare over time—which come from asking employers how many of the contracts they have—give us data just for the number of zero hour contracts, rather than the number of people on them. They also only give us data for the change from January 2014 to January 2015. The two million jobs claim refers to the increase of people in employment since the election—a rise of two million people from the three months before the 2010 election to May to July 2015. Comparing an increase in the number of zero hours contracts with the increase in people in work is problematic because one person can be on more than one zero hour contract. That's aside from the problem that the zero hour contracts comparison doesn't stretch back as far as the election. The increase in the number of zero hour contracts was 91,000 contracts between 2014 and 2015 (a 6% increase from 1.4 million to 1.5 million contracts). This increase was not statistically significant. "Our wages now are less than they were before the economic crisis"
Adjusted for inflation, the average worker earned £520 a week in December 2007, whereas they earned £496 a week in July this year. This figure doesn't include the earnings of self-employed people, who make up about 15% of people in work. 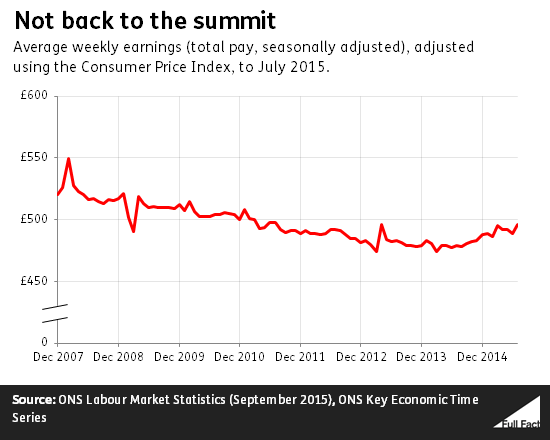 Average weekly earnings can change because people are taking different jobs. Using a slightly different dataset, the Office for National Statistics has found that pay for employees in low, medium and high-skilled occupations has fallen more than pay overall, and that employment shifting towards high skilled occupations, which pay more, reduced the overall drop. You can read more about changes in high-skilled jobs here. "We have a million families dependent on food banks in this country"
The most commonly used figures for food bank use come from the Trussell Trust. It was previously reported that over a million people—not families—used its food banks in 2014/15. What the Trust actually meant was that its food banks provided for the equivalent of about one million people using a food bank once each over that year. There were one million uses of Trussell Trust food banks last year, not one million people using them. The Trussell Trust describes its service as "emergency food and support", not sustained food provision. About half of the Trust's users only needed one food bank voucher in a year and only 15% used the service more than three times in a year. On average, the Trust says its users needed two food bank vouchers annually, so the number of people using its food banks is likely to be around half of the 1.1 million figure. The Trussell Trust isn't the only organisation running food banks in the UK, so we don't have an overall figure for the total number of people, or families, fed by food aid providers. The Trust runs 445 food banks, while the total number of food banks that exist may be around 800 or more. It's not possible to extrapolate from the Trust's figures to the number of people using all food banks in the UK as it's not clear whether other food banks have similar patterns of use, similar referral systems, or operate on a similar scale to the Trussell Trust. But using the Trussell Trust figures, it's wrong to say that a million families use food banks. Two sentences were added to explain the number of Trussell Trust food banks and the total number of food banks overall, and to say that it is not possible to extrapolate from the Trussell Trust data to all food banks. A sentence from the article was also added to the 'verdict' to say that we don't have an overall figure for the total number of people fed by food aid providers. Pay gap: do women earn 80p for every £1 earned by men? Did Labour put up tax on earnings by £1,895?